We are calling urgently on Orkambi’s manufacturer Vertex and governments across the UK to agree on an affordable price that can make the life-changing drug immediately available to those who so desperately need it. Our message is clear: we need Orkambi now. Protesters across the country have gathered at Holyrood, Stormont, the Welsh Assembly and Downing Street at 1-4pm this afternoon. So you may be wondering, what is Orkambi? Orkambi is a drug that is used to treat certain aspects of Cystic Fibrosis in people who have two copies of the F508del mutation. It is a combination of the drugs Lumacaftor and Ivacaftor. Currently Orkambi is the second drug licensed in the UK to help treat the underlying genetic cause of Cystic Fibrosis in the 40% of the CF UK population that have two copies of the F508del mutation. Unfortunately due to costs it is not available for most patients on the NHS except in rare cases. Despite recognising the life-transforming cystic fibrosis (CF) treatment Orkambi® as important and effective for managing the condition, the National Institute for Health and Care Excellence (NICE) has rejected it for use in England because of uncertainty around long-term value and impact, and therefore cost-effectiveness. What does Orkambi do exactly? It is a combination medicine, made up of Kalydeco (Ivacaftor) and Lumacaftor. The Lumacaftor helps get more proteins to the surface of cells in the body, and Ivacaftor helps the chloride channels in the cells to operate more effectively. The combination of these two things helps to keep a healthy balance of salt and water in the organs – particularly the lungs. Recent data from a 96-week study has demonstrated that Orkambi can slow down the decline in lung function experienced by people with cystic fibrosis by an average of 42%. This decline of lung function is the main cause of death in people with cystic fibrosis and has a serious impact on quality of life and an individual’s ability to stay active and independent. My son Joseph cannot benefit from the Orkambi drug currently as he does not have two copies of the F508del gene, but this does not mean he will never benefit from the life improving drug in the future. If the drug proves successful for people with two copies of the F508del gene then more trials will take place to see if it is a viable drug for other CF sufferers. It seems unfair that once again people’s lives have been deemed “not cost effective”. 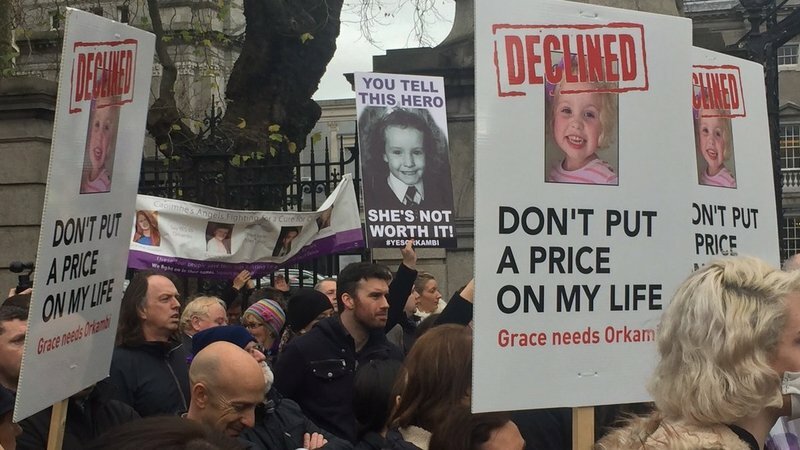 If your child was one of the 3,296 would you let drug companies put a price on your child’s life? You can share your stories on social media using the hashtag #OrkambiNow. You can lobby your local politician by CLICKING HERE The CF Trust have created a template letter that you can use to lobby your local politicians. You can donate to the Cystic Fibrosis Trust HERE.